Ready or not! Here it comes! Winter is on its way! If you live in the Midwest, it is time to winterize your house and stock up your pantry. It is also time to bring in any plants that were taken outside for the summer. There was a radio talk show host in the late 90’s who had a rant titled, “Houseplants are HOUSEplants! They are supposed to stay in the house!” But for those of us who have sentimental plants that are precious but large, taking the plant outside is a necessity in the summer. Spray the plant for any insects that are common to the plant as a preventive measure. 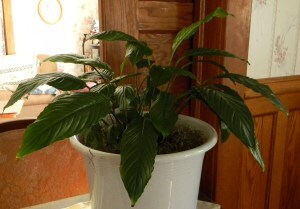 Relocating a plant to the warmth of your home will encourage insect survival. Be sure that any houseplant spray you use will kill insect eggs. If it doesn’t kill the eggs, plan to spray 3 times at two week intervals. Be safe by making sure that the plant you are spraying is listed on the label. Many plants are killed because they were sprayed with a chemical that was not safe for them. If you want to use less chemical and have more effect, place the houseplant inside a trash bag while it is outside for spraying. Carefully spray the chemical into the bag. Quickly seal the bag with the plant and chemical inside. Leave it alone for 24 hours away from direct sunlight. After 24 hours, open the bag and air out the plant for about an hour. Then bring your treated plant in the house. This system can also be used inside. Be careful to keep all chemicals away from pets or children. Trim away any dead or dying leaves. The plant will continue to try to support any weak leaves. Removing them helps reduce insect and disease possibilities as both attack dying tissue. Pay attention. With houseplants it is very important to pay attention to them. Insect and disease problems often start slowly but spread quickly and if you are paying attention, the problem leaves can be removed and the problem remedied before it affects the whole plant. Growing and caring for plants is a very satisfying way to pass the winter. Transitioning your plants from their summer home to their winter location is easy, but takes some finesse. If you really need to have blooms through the winter, search out paperwhite bulbs, zygocactus (also called Christmas Cactus) or amaryllis. For easy greens choose spider plants, peace lily, or Norfolk Island pine. Whether they are Aunt Violet’s African violets or a new and exotic species that you discovered at the local greenhouse, plants are great company and worth the attention. If you have any thoughts about bringing in plants for the winter or stories about the plants that you have inherited that have been part of your family, please add a comment to this post or contact John at John@JohnMuellerBooks.com.